t*rexes and tiaras: La vida es chula.. I'm not sure what's come over me lately but I seem to have acquired several new handbags. Somehow, that doesn't seem to show any sign of stopping. I thought I was all about the shoes, but perhaps this is a whole new direction of expansion for me..?! Anyhow, this is the latest addition and it's even cuter than I expected it to be. 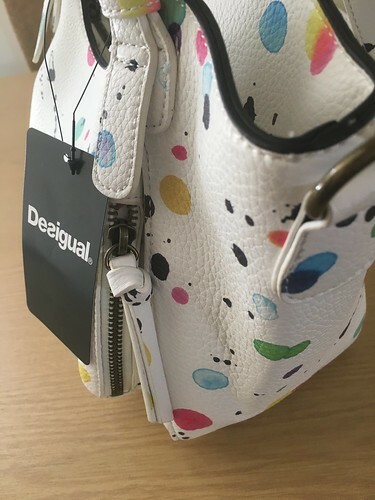 I've not had anything from Desigual in the past, although they're a brand I've heard of. This bag is called the Rotterdam and it's described as being mini in size, but I'd say it's pretty perfectly proportioned to carry all of the essentials. 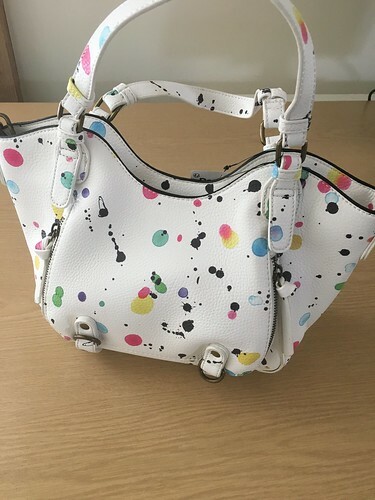 It's white, which isn't always my first choice, but the bag is covered in a paint splatter effect print in all different colours, which gives is a whisical feel and allows me to pair it with just about any colour. It;s got a detachable shoulder strap and the main zip compartment is really quite large. 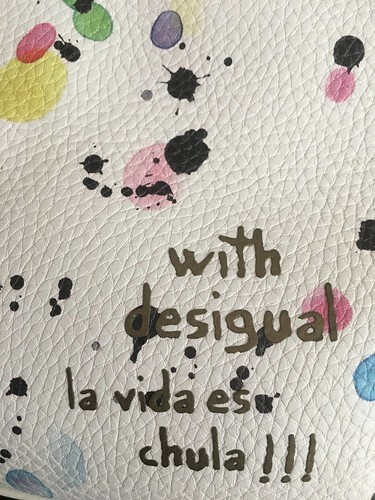 There are faux zip and buckle details on the front, whilst the back has this little quote printed on it, which translates to Life is Cool.